Our four interns worked on developing a brand strategy for Rufus & Coco, as well as working on a variety of smaller projects independently. Our interns were described as being "exceptional candidates" that were an "invaluable resource" who could "work well independently", and have "good communication skills and confidence". Each of our students bring their unique skills to their internships. Rufus & Coco were able to put to great use our student Della's Chinese bilingualism. Della was able to provide Chinese translations for their marketing materials, to be distributed to their expanding market in China. We caught up with Della Xiaona Zhuang on her last day of her internship. Read below what she had to say about her experience. "Rufus & Coco are an small company, which meant more care and assistance when I needed help." "I had the opportunity to work on a variety of small projects, about 8 projects in total. One of my projects was to conduct market research, looking at both local and international markets." "The projects I worked on initially were less complex, with each project having a progression of difficulty as my learning grew." "The internship has provided me with a great understanding of the industry, both local and international. It has also given me an understanding of how businesses work, and what it is like in a workplace. This provides me with an expectation of what it will be like when I get a job after graduation." "I believe an internship is the best way to find out what you really want in your career, and prepare your skills and mindset in a real workforce. My industry placement with Rufus & Coco allows me to gain the first-hand marketing experience as a university student." "Through the internship offered by PACE, I was able to get to know this industry and challenge myself in those skills. Most importantly, it assisted me to set up a solid foundation for my future career in marketing." 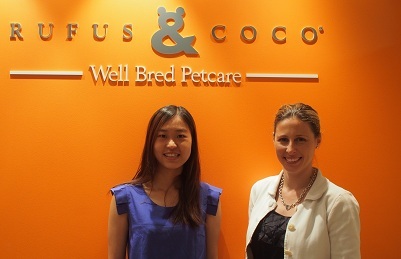 Rufus & Coco is an Australian-owned company, producing Australian-made premium pet care items. Having a good reputation in the Australian pet-care industry, they are expanding their market and exporting their products overseas. They produce a range of products, from grooming and accessories, right through to animal apparel and vitamins, with the moto of "look good, feel great". Last Updated: 2014-06-19 11:31:55 by Emily Inglis .